Bus from Batu Pahat to Malacca is one of the highly sought-after bus service in Batu Pahat Bus Terminal. Many residents in Batu Pahat prefer to take bus rather than driving their cars to Malacca. That is because taking bus is way more convenient and simple to get to Malacca from Batu Pahat. S&S International Express and Cepat Express are the only two bus operators serving bus from Batu Pahat to Malacca. Their combined trips have only up to 3 daily trips. S&S International Express has 2 daily departure while Cepat Express has only 1 daily departure. The first bus service starts in the morning 8.00am. The following schedules are 2.30pm and 8.00pm. The duration required from Batu Pahat to Malacca takes approximately 2.5 hours. Duration time may be varied depending on traffic and weather conditions. Washroom break will be given upon request from the driver even in a short journey. The bus fare from Batu Pahat to Malacca is costs in a range of RM 9.90 to RM 12.40 for adult depending on your selection of bus operator and type of the ticket. Both operators offer child fare at range of in a range of RM 7.40 to RM 9.30. Bus departs from Batu Pahat will pick up all the passengers at Bus Pahat Bus Terminal. Upon arriving in Malacca, the bus service will terminate at Melaka Sentral Bus Terminal. From Melaka Sentral Bus Terminal, passengers could take public bus or taxi to the town area. Due to limited schedule and seats available, passengers are strongly encouraged to book their bus ticket from Batu Pahat to Malacca online in advance via BusOnlineTicket.com. 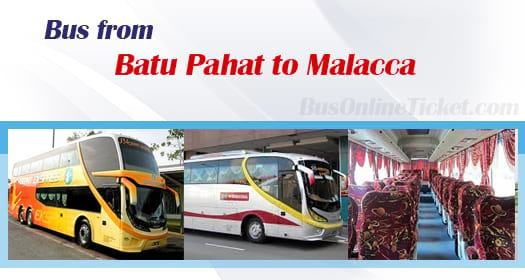 Passengers can earn BOT Miles by making booking for bus ticket from Batu Pahat to Malacca on BusOnlineTicket.com. With our loyalty program, earning BOT Miles allows customer to redeem for discount code and claim for bus tickets.